More light, better visibility, improved safety: With VertiLight and LED Stripes, Linde Material Handling was presenting two new lighting concepts at LogiMAT 2018. Both concepts provide better illumination of the working area and thus make load handling even more efficient and safe. Regardless of which sector or kind of goods, wherever loads have to be moved, a simple formula applies: better visibility = increased safety = less damage to shelves, equipment and goods. Additionally, proper lighting also increases productivity in day-to-day logistics operations. For example, the storage and retrieval of pallets on shelves is naturally done more quickly when the working area is optimally illuminated and the driver can control the truck and lifting mast in a targeted manner. In addition, pleasant lighting conditions have a positive effect on employees’ well-being, concentration and performance. Linde Material Handling therefore devotes special attention to the issue of lighting and presented new lighting concepts at the LogiMAT 2018 trade show. Linde VertiLight provides valuable services, especially for storage and retrieval processes involving (high-bay) shelves. The luminaires consist of LEDs arranged in a semicircular way that are mounted on the mast (in parallel for counterbalanced trucks, offset for reach trucks). These provide the best possible illumination of the working area from the floor to the lifting height. In contrast to regular work lights, they do not produce a spotlight cone when working at shelves, but rather a wide-area, uniform and glare-free illumination. At 6,500 Kelvin, the color temperature of the VertiLight is similar to that of normal daylight – this helps to prevent driver fatigue. The vertical lighting angle can be individually adjusted to the respective requirements during operation. 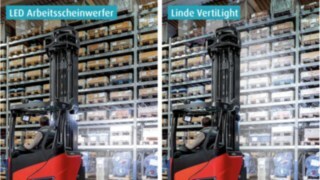 In contrast to regular work lights, the Linde VertiLight does not produce a spotlight cone, but rather a wide-area, uniform and glare-free illumination from the floor to the lifting height. The second lighting innovation from Linde also promises rapid work results with greater safety and – like VertiLight – can be ordered either as optional equipment ex works or as a pre-assembled retrofit solution. The LED Stripes are light strips which attach to the front and rear overhead guard of counterbalanced trucks. They ensure the optimal distribution of light in close-up range and illuminate even the remotest corner. Movements of the fork carriage do not impair visibility. The strips radiate white in the direction of travel, while the other side changes to red. This is an important indication for pedestrians as well as other forklift drivers and enables them to see from a distance in which direction the truck is moving. Additionally, there is no danger of them being temporarily blinded at any point as the high-intensity LEDs emit a light perceived as especially natural (5,700 Kelvin). 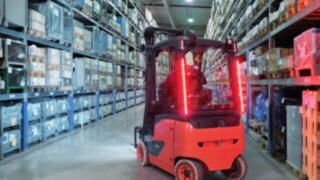 The LED Stripes from Linde are light strips which attach to the front and rear overhead guard of counterbalanced trucks. They radiate white in the direction of travel, while the other side changes to red. This enables pedestrians and other forklift drivers to see from a distance in which direction the truck is moving. Greater safety means fewer accidents. That’s why the new lighting solutions are in line with Linde Material Handling’s safety approach. “Vision Zero. Safety in your world” is aimed at reducing accidents in goods handling to zero in the medium term by offering the right products, services and consultation.